We dressed up as pirates for our topic treasure island! Below is Kingfisher Classes curriculum overview for this half term. You can click to view to document or download the PDF on the link below. We have been enjoying the sunshine and learning about the different stages of the butterfly life cycle. We have been learning to cross the road safely! We made fruit Salsa in Cookery, it was really tasty! We all enjoyed our trip to Asda. This half term Kingfisher class will be studying the Literacy book Cinderella we will be taking part in writing, speaking/listening and reading activities linked to the text. We will also be performing in a Cinderella Christmas performance. In Maths we will spend a week on money, number, geometry and measure. Our Topic this half term is Over the rainbow and we will be exploring colour mixing and looking at a different colour every week. We will be dressing in the different colour for our Assemblies and trying out coloured food each week. I will be asking the children to bring a toy or object in, of the colour of the week to share with their friends. The Topic is great for lots of lovely art and colour collages and we will be sharing some of these on the website so please check back soon to have at look at these. Computing this half term will be storytelling and lots of lovely activities linked to the Cinderella story. We have planned trips to Ashridge woods, Poplars garden centre near Christmas time to look at the decorations and lights and Gullivers land. Welcome to Kingfisher class I am Colette the class teacher I am supported in class by Charlotte, Kerry, Lauren and Leah. The children in the class are Aayan, Abdi, Borys, Haris , Linus , Mohsin and Shahid. 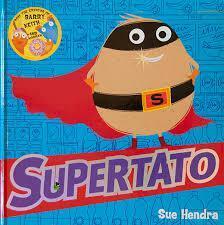 This half term we are studying the Literacy book Supertato. Meet Supertato! He's always there for you when the chips are down. He's the superhero with eyes everywhere - and he's about to meet his arch nemesis. The fabulous new character from Sue Hendra, the bestselling illustrator of Barry the Fish with Fingers and Norman the Slug with the Silly Shell. We will be participating in lots of writing, speaking and listening and reading activities linked to this book. Topic this half term is We are the champions we will be looking parts of the parts, exercise, staying healthy and safe. We will be ending the Topic by creating our own exercise video using the green screen. We will be having trips out in the local community to Asda to buy the vegetables in our Literacy book and to the local park to use the exercise equipment.